SEO is slow. It can take years to build up the authority of a domain and the rankings of pages. Search engine optimization is the slowest form of marketing I know. It really is. But there’s one big shortcut. The goal is to find a keyphrase that you’re already ranking for, but not ranking that high. If you can find these phrases, you can find the corresponding page. If you can find the page that’s ranking, you can better optimize it for the phrase and watch the rank jump. Make sense? Here’s the summary again, then we’ll go into detail. Find the phrases for which you almost rank high. Find the page in Google search results. Confirm the ranking. Next, improve the page by better indicating the relevance for the phrase. Check back and see if it worked. It’s very fast. There is no need to research keyphrases since Analytics will give us the phrase. No need to check competition, because it’s already ranking in Google. That’s why this is the fastest way to increase Google rankings with the smallest possible effort. First, let’s find the phrases that you’re almost ranking high for. It’s in Google Analytics in this report: Acquisition > Search Console > Queries. Note: if you aren’t able to access this report, you probably haven’t connected your Search Console account to Google Analytics. There’s a video here that shows how to set this up. how high you rank for the phrase (average position). Note: this report shows data for only the last three months and shows no data for the last two days. Set your date range to cover three full months to get as much data as possible. We’re looking for phrases that already rank in Google, but could use improvement. We need to use an Advanced Filter to find just the phrases for which we rank high, but not too high. Here’s what that filter looks like. The idea is that a page that ranks greater than 10 is high on page two. This assumes that there are 10 organic search listings on page one, which really isn’t the case, but it’s close enough for us to make this work. No one wants to rank on page two, but the good news is, high on page two is almost page one. You’re right below a tipping point. This is low hanging fruit! Click the column header “Average Position” to sort the report. Actually, you’ll have to click it twice so you can see the 11s at the top. Save your filtered, sorted Queries report as a shortcut. This will make it easier to get to next time. Just click the “Shortcut” link above the report, name it and click OK. Now the report will be available anytime in the left side navigation of Google Analytics. You’ll quickly notice that this report shows some strange phrases. Things that seem irrelevant. Don’t worry about them. Every site ranks for unrelated phrases. Just ignore them and keep looking. This report may also show phrases that include your brand name. Skip past those too. Search engine optimization is about ranking and getting traffic from non-branded phrases. Phrases entered by people who are researching a problem, without yet knowing how they want to solve it. Phrases entered by people who know how they want to solve their problem and are looking for a presumed solution. They are often ready to spend money. The money (as in, the leads) are in the buyer-related phrases! Find a few? Great. Let’s move on. Start searching for the phrases in Google to confirm your rankings. Now you’ll notice that the “average position” really isn’t the same as rankings. Sometimes, you’ll see yourself ranking higher than the report suggests. Other times, you won’t see your site at all. There are a lot of reasons for the discrepancies. Your site may have more than one page that ranks for the phrase. Your site may rank in image search results. Your site may rank differently today than the average ranking across the date range in the report. Your search results may be personalized for you based on your location, browsing history, etc. You can avoid that last issue by doing a few things before you search: logging out of Google, using “private” or “incognito” settings in your browser, using a browser you don’t usually use, using a proxy server to connect to Google or using Google’s Ad Preview tool. Note: Really, there is no such thing as an entirely neutral search. That’s why A/B testing for Google rankings is impossible. There are actually many versions of Google out there! So don’t worry too much about trying to be anonymous. Don’t expect the data to be accurate. You’re just looking for clues. Find a page that ranks for a phrase, but not too high? Great. Let’s keep going! Now we want to see how well the page was optimized for the phrase. Does the phrase appear on the page in the right places? Was the page indicating relevance? It’s possible that the phrase hardly appeared on the page at all. It’s possible the ranking was completely accidental. While viewing the page, search for the phrase (using control+F or command+F on a Mac) just like you would inside a Word document. Does the phrase appear on the page? Does it appear all together, or is it broken up? Where does it appear? In the title, header and body text? How many times is it used in each location? If the phrase isn’t in the title, header and body text, then this page wasn’t really optimized. The Google rankings were accidental. Warning: Before you proceed, check to make sure that this page isn’t already ranking for other phrases. It’s possible to indicate the relevance for one phrase and hurt the relevance for another phrase. 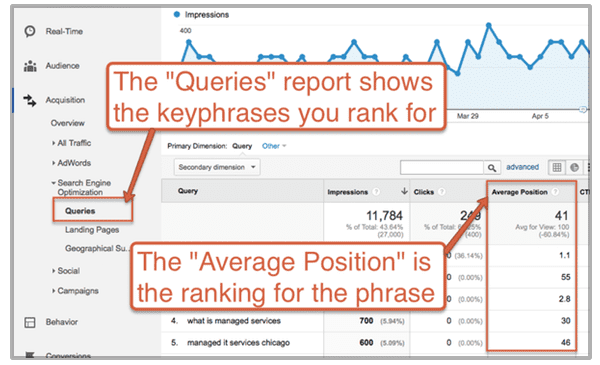 To make sure you don’t de-optimize it, go back to your Queries report and look for other phrases the page might rank for. Search for these phrases in Google. 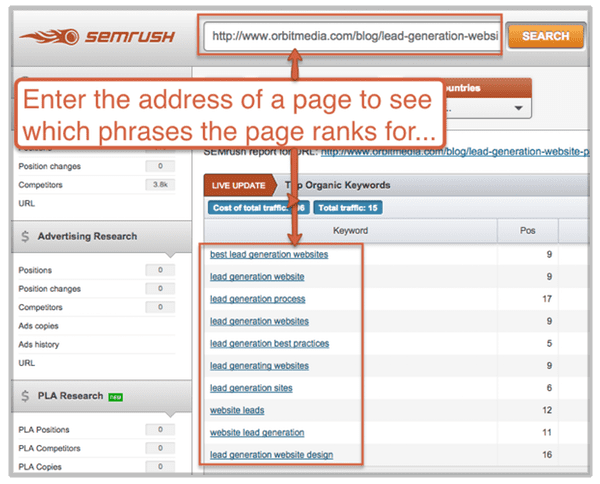 Or just enter the page address into SEMrush. This will tell you all the phrases the page ranks for and how high. That’s great data! If the page already ranks for another phrase, check the volume in the Google Keyword Planner. Is the phrase more popular? Is it a more relevant phrase that may bring more targeted traffic? If either answer is yes, don’t hurt the relevance for this phrase. Go back to the beginning and start again, or proceed to the next step using the better phrase. Search engine optimization is all about indicating relevance. We indicate relevance using on-page SEO best practices, which we’ll summarize here. This is the <title> tag, which appears in the code, but not on the page itself. It does show up in the browser tab and it’s often the clickable link in Google search results. If your site is in WordPress, the titles may be managed within a plugin such as Yoast. Ideally, the target phrase appears at the beginning of the title and words of the phrase are kept together, with no words breaking it up. This is the <h1> tag, which is generally the headline on the page. There is no magic number for keyword frequency, but high ranking pages tend to be long, with 1500 – 2000 words. Remember, Google is a research tool built by library scientists. Google loves text! If your page is 1500 words, it’s likely that four to six instances of the phrase feels natural. If the page is short, don’t try too hard to fluff it up by adding length. But make sure the phrase appears at least once, all together as a “bonded” keyphrase. Search engines are really more about topics, meaning, and intent, rather than words and phrases. As Google gets smarter, they pay more attention to “semantics” rather than a string of letters. 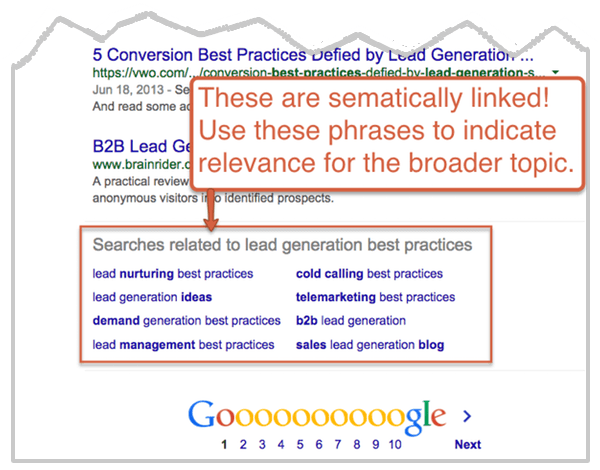 So smart search optimizers are paying attention to the broader meaning of their pages and indicating relevance by using other, semantic keyword phrases in their content. To find which words and phrases are semantically linked to the phrase you’re targeting, look for clues at the bottom of a search results page. Find anything? Ask yourself if it makes sense to work those phrases into your page. If so, work one or two of these into the body text. If you want to increase your Google rankings, your goal is to make the best page on the internet for that topic. Don’t try to trick a robot. Do try to help people find the information they’re looking for. Look for ways to make the page great. Add detail. Add examples. Add links to other great pages. Add graphics. Add a video. Don’t just add keywords. It’s all about the reader. Make it a better page in any way you can. How’d we do? Ranking a bit higher? If you don’t see a change within a week, you probably aren’t going to see a change at all. In my experience, a few small changes can have a big impact on rankings, especially if the page wasn’t well optimized to begin with. Example 2: It’s in the video above. A special thanks to Mother G for letting us mention them here! Example 3: Scroll down to see the example in the comments from Rosemary O’Neill. Congrats to Rosemary for jumping on these tips and getting quick results! It’s the fastest way to improve your rankings and it works really well. The only downside is that there are only so many opportunities in this report. Eventually, you’ll have eaten all of the low hanging fruit. It’s called search engine optimization because it involves iterative improvements over time. It’s not something you do once. Repeat this tactic every few months! Very good article. Makes a lot of sense. Also, optimize the site for mobile. Rumor has it the new Google algorithm update’s prioritizing optimized sites now. Wow! Man, that was super helpful. As someone who sort of understands SEO, it’s great to see a real world example of how a few tweaks can make a big change. We can also speed up our ranking process by understanding our audience. It is one of the finest parts of information the moment it concerns search engine optimization for smaller enterprises will be always to spend time knowing your own audience as well as their aim. Actually when your site is optimized, when it really is done to the incorrect audience, you are not going to find decent targeted visitors. Google is accepting audience intention into consideration increasingly more and longer important since upgrades such as RankBrain take to comprehend that the semantics of a website hunt query instead of only the literal definition of these words. In the event that you’ll be able to immediately answer the queries that your crowd is currently requesting, your website will rank highly in Google organically. Great stuff as always Andy! Extremely useful and the video made everything easy to follow along with. Looking forward to testing this out on my website. Thanks! Very helpful content Andy!! I’m so impressed that a few changes can make such a big difference! Thank you so much for being part of this, Armita! This post wouldn’t have been the same without your cooperation. Let’s talk more about how to get that page to rank higher. Also, let’s measure the increase in traffic and leads! Just to follow up with our magical results…I targeted a couple of minor tweaks to a phrase we weren’t even targeting before, but ranked mid-page two (de-personalized search). As of this morning, we are 3/4 down the page on page 1. Sweeeeet! NICE WORK! That’s what it’s all about. I just made a note in the post above that you’re seeing results from this trick. Congrats, Rosemary! I judge articles by asking, After reading can I immediately start doing the steps described and get results? Nearly all “thought leaders” write abstract nonsense that is of zero practical value. One of the most famous analytics bloggers isn’t a thought leader, he’s a cheer leader. I give articles like this one an A+. I truly appreciate that feedback, Greg. I’m kind of a tough critic too and that’s exactly my criteria. Was it practical? Can I use this information right away? This is a great strategy, Andy. I often do the same thing for pages ranking in positions 2 – 10 as well, as the traffic you recieve from a given phrase increases somewhat exponentially (particularly within the top 3 or 4 spots) as you go from the bottom of page 1 to the top. Great article, very concise yet detailed video, I like visuals. Nice job! Andy–you are awesome. Loved the combination of video and text. @Andy Such a great post! Great article Andy. Its amazing how may pages have terrible title tags. An article of the finest quality indeed, Andy, thanks for taking the trouble to share these insights! You do mention long pages 1500+ words and how much Google loves text. In the featured example of Mother G, they barely have any text on the home page, yet they rank for that key phrase. Such is the case of many modern looking one pagers as well and the ranking success of these home pages honestly baffles me beyond reckoning. Could you possibly shed some light on the issue, please? Neil Patel just wrote a great article on this. Hope this helps!! As a total SEO novice, I thought the video was very helpful! I watched it after reading the article and it really underscored the steps. Thanks, Sharon! Glad you liked it. If it works for you, please let us know. That was super helpful thank you. I’ll be sharing this with my audience. Absolutely brilliant article! So many SEO articles are just fluff but this literally taught me a 100% actionable technique that I am using with a client right now. I’m signing up for your newsletter. You have a new loyal reader. Thank YOU! Very nice! Keep us posted on the results. Good luck and thanks for dropping by and leaving a comment! Very relevant information Andy. Thanks for sharing something small and simple that yields BIG results! As you said, SEO can take years to “kick in”. But that doesn’t mean you can’t use certain strategies to speed up the process. Like this one. Good stuff :-)use to follow this way of ranking improvements technique. This is beneficial for both brand exposure and traffic generation.Such is the case of many modern looking one pagers as well and the ranking success of these home pages honestly baffles me beyond reckoning. 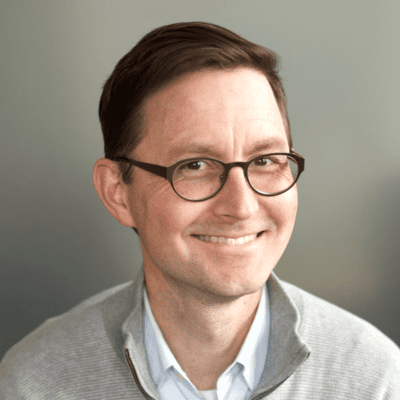 Great article here – I used to thumb through google webmaster’s and do a similar strategy, but having this for all of our SEO clients makes it a lot easier to manage. i tried it but i dont have but 1 query to work with. U have a thousand to work with. im about 3 weeks into this day n night. I cant figure it out. I’m glad you found this useful! There are lots of other Analytics and SEO posts on this blog and in the book, Content Chemistry. I hope the other techniques work just as well for you! I will try and test this for my fashion blog. Thank you! I have to say, I was quit stunned to see how fast this works. I updated a few pages like 10 hours ago and when I woke up this morning I didn’t expect anything, but was curious anyway… So I checked a few key phrases, in a few hours my pages have managed to go up a little. One even reached first position for a certain keyphrase. What I don’t really understand though is that it is my homepage that is suddenly on the first place for that keyphrase, while I’m pretty sure 10 hours ago it wasn’t even on the 3 first pages. Maybe Google is playing tricks on me :-). But thank you for the very helpful post! Has anyone had this negatively affect their rankings? Our page isn’t showing up in the 1st 5 pages or more, and I’m not sure what I did wrong. I added the search word in the title, link, headings, and text. The only thing I can think of, is that by changing the link, I broke a few ads and homepage buttons that were going to the old link. We’re fixing this now, but I’m not sure how to tell if this was the entire problem or how long it will take to fix within Google. Hi, Margaret. Ideally, you don’t change the URL so you don’t break any links. Changing a URL (even if it doesn’t break links) can negatively impact your rankings. I almost never recommending changing the address of anything! Thanks Andy! I made the change to the url, because I had read that it is ideal to have your keyword in the url in addition to the title, headings, etc. In hindsight, I see why this wasn’t the best move. Good, practical stuff here. I have to tease you a bit about the 10 minute video that explains what can supposedly be done in 5 minutes (ha), but the recommendations are solid and helpful. Thanks! Awesome! Thanks Andy. I just took over a site that was recently launched so I’ll be making this survey on my pages, as well. You just took it over? Here’s your chance to drive some huge ROI, Johnny! Its an informative article. Really great work ! Verrry useful! Thank yo so much! Keep doing what you doing. Easy listening, interesting, just do it dude1 Awesime. Well I really think that you nailed it with this amazing post. I liked the fact that one can always speed up the process of SEO naturally. Thanks for sharing this beautiful piece of content on the internet, i’m highly obliged and it’s my privilege sharing this article online. Amazing! On Dec 24th I made some very small changes to two keywords on a passive niche site I have. Today (Dec 30th) both terms have risen in ranking (from 10 to 8.1 and from 7 to 5.1). I can also see that traffic has increased as have click through rates on my affiliate links. Thank you!!! Great article! Nice tips on how to increase ranking, simple and easy. Wow! amazing post man. I am new in the industry and these tips will help me a lot. Thanks for sharing. Very informative stuff Andy. I will test this method on my new website. Thanks a lot. Here you shared such a useful stuff which is useful for number of members like me. Awesome info man… Improving few things make lots of changes in ranking..
Website/Blog optimized for mobile will also get good ranking in google serp according to google mobile algorithm. Wow, it’s awesome post again! Very useful and informative post. Thanks for sharing these nice tips with us. Definitely I’ll try to follow these and improve my PR. Good article. I really like the point of LSI Keyword and improve quality. I use SEMRUSH and SERPLAB to check my current ranking. Hi Andy, its a nice tutorial, i just change some of my keyword base on your tutorial, lets see a couple of days if it work. Helpful information. We can find same data from Google Webmaster also right. Thanks, good tips for everyone! Still a great technique in 2017. Some people refer to this as the Skyscraper Technique (i.e. find out who has the “tallest building” or best ranking, and then outdo them by a few “feet” or better articles). Very helpful content Andy!! Thanks for sharing something small and simple that yields BIG results! Great article. Thanks for the advice. I’ve done most of these but there were a few things I’ve been missing. Some great tactics here. Thanks for the article! Andy is this still relevant “now” in late 2017 heading into 2018? I tried somethign very very similar a while back on some posts.. they upped a bit but then came back down… however I did literally only add in keywords, not go to great lengths or add in semantic words..
How far can referral domains affect keyword rankings for any particular domain? How to properly rank a single keyboard? Sorry not a keyboard its keyword. Great blog post. Some very practical advice, which is much appreciated. “(other)” is one of the the queries used in the report. What does this represent? I understand how to rank site & my site is ranking very fast…. Too good content, Definitely this help for my website rankings. I’m old. I’m lost in all these digital gobbledygook. But THANKS, ANDY, you made this tutorial so easy. I had to nove at a snail’s pace while implementing because I had to integrate/activate a bunch of different stuff. Now, I only have to wait to see if it worked. I also found very helpful, the added SEO optimization bits at the second half of the article . I’m saving this tutorial as my SEO AMMO because, again, I’m old. I forget. Big Smile!